Full name is Norichika Aoki, pronounced noer-EECH-kuh AH-oh-kee. Attended Waseda University in Toyko, Japan...was teammates with former Cubs pitcher LHP Tsuyoshi Wada, who spent the 2016 season with the Fukuoka SoftBank Hawks. Nori's wife, Sachi, was a popular sports anchor for TV Tokyo from 2006-2010. Spent his first eight professional baseball seasons in the Japan Central League, playing for the Tokyo Yakult Swallows from 2004- 2011...was a three-time batting champion in 2005 (.344, 2007 (.346) and 2010 (.358). Participated in the 2006 and 2009 World Baseball Classics, batting .310 (13-for-42) with eight RBI...competed for Japan in the 2008 Summer Olympics...hit a three-run homer off Brett Anderson in the Bronze Medal Game against the United States; however, the U.S. won 8-4. Claimed off waivers from Seattle on Nov. 3, 2016...agreed to terms on a one-year contract that runs through the 2017 season on Nov. 30. In his lone season in Seattle, hit .283 (118-for-417) with 63 runs, 24 doubles, four triples, four home runs, 28 RBI and a .349 on-base percentage in 118 games...he hit .245 (61-for-249) before the All-Star Break, but .339 (57-for-168) afterwards...his batting average after the break was second-best in the American League during that span trailing only Miguel Cabrera (.346, 90-for-260)...became the 11th different Mariners player (previously accomplished 19 times) to hit .330 or better (min. 150 AB) after the All-Star Break...of those 11 players, Aoki became just the second Mariner to hit better than .330 in the second half after batting .250 or worse before the break...he joined Bret Boone, who hit .229 (75-for-328) before the 2002 All-Star Break, but .336 (94-for-280) afterwards...hit 24 doubles, good for second-most in his career (37, 2012 with Milwaukee)...his 16 doubles after the All-Star Break led the club...overall, hit .300 (96-for-320) vs. right-handed pitchers but just .227 (22-for-97) vs. lefties...from July 20 through the end of the season, hit .444 (8-for-18) vs. LHP...made a career-high 14 starts in center field (previous: 13, 2012 w/MIL)...hit .369 (24-for-65) with 15 runs, six doubles, three home runs and 11 RBI in 19 games in September...his .369 average was third-best in the American League during the month... opened the season on Seattle's roster...was optioned to Triple A Tacoma on June 24, and was recalled on July 20...was optioned again on Aug. 26, and was recalled on Sept. 6, where he remained through the end of the season...recorded a season-high eight-game hitting streak from April 5-13, batting .313 (10-for-32) with two runs, two doubles and one RBI during the streak...drew 17 walks over 19 games from April 22-May 13...recorded each of his six multi-walk games during that span...recorded 40 consecutive plate appearances without a strikeout from May 18-May 30...hit his first home run with the Mariners on May 28 vs. Minnesota...became the fourth player in club history whose first home run with the club was a leadoff home run, joining Jack Perconte (5/17/85 vs. BAL), Rickey Henderson (5/20/2000 vs. TB) and Austin Jackson (4/19/15 vs. TEX)...recorded two hits at Tropicana Field on June 14 at Tampa Bay, officially giving him a hit at all 30 current Major League ballparks... optioned to Triple A Tacoma on June 24 for the first of two stints with the Rainiers...from June 28-July 19, hit .361 (22-for-61) with 13 runs, three doubles and three RBI in 15 games...optioned to Tacoma on Aug. 27 (post-game 8/26) and hit .226 (7-for-31) with four runs, one double, one home run and three RBI in eight games from Aug. 29 - Sept. 5...overall, hit .323 (31-for-96) with 17 runs, 5 doubles, one home run, and seven RBI in 24 games with Tacoma. Totals - Hit .287 (102x355) with 42 runs, 12 doubles, 3 triples, 5 home runs, 26 RBI and 14 stolen bases in 93 games with San Francisco. ... DL - On disabled list twice and missed total of 63 games due to fractured right fibula (6/24-7/27) and concussion (8/13-20) that lingered through Aug. and most of Sept. ... Defense - Appeared in 93 games, 85 starts (82 in LF, 2 in RF, 1 as DH). ... Injuries - Missed 28 games after he suffered fractured right fibula June 20 at Los Angeles (NL) when he was hit by a pitch… after rehab stint with AAA Sacramento, was activated July 27, but appeared in just 13 games before suffering a concussion. ... Concussion - Left game Aug. 9 at Chicago (NL) after being struck in helmet by pitch from Jake Arrieta…left game under own power and started three days later, but was removed from game Aug. 12 after experiencing dizziness and nausea…removed from DL and appeared in 13 games before season ended due to post concussion symptoms Sept. 5. Nori got off to a slow start, but finished strong in his first season with the Royals...hit .285 with 22 doubles, six triples, a homer and 63 runs scored...Batted .379 (33-for-87) over the month of September, third-highest in the American League...his .432 OBP over the final month also ranked fourth in the A.L...his September batting average was his highest in a month since coming over from Japan prior to the 2012 season...Ranked fifth in the Major Leagues (third in the A.L.) with a .363 batting average (45-for-124) against left-handed pitching...it was also the highest average in baseball vs. lefties by a left-handed hitter...over his three seasons in the big leagues, Nori's .319 average against southpaws is 19th in the Majors...Set a club record with 11 hits in a series against the White Sox (September 15-17), going 11-for-13...also drew a pair of walks to reach base 13 times in the series, the first Major Leaguer to do this since Kevin Kouzmanoff did it (11 hits, walk, HBP) at Milwaukee, August 11-13, 2009... recorded consecutive four-hit games to open the series, becoming the first Royal to do that since Mark Teahen, August 22-23, 2006 vs. Cleveland...Became the third Royals player to record two outfield assists in an inning, August 8 vs. San Francisco, throwing out Hunter Pence at third base and Joaquin Arias at the plate in the third...Amos Otis (April 25, 1970 vs. Baltimore) and Bob Oliver (September 16, 1969 vs. Seattle) were the other Royals to do this...Hit his first career grand slam August 5 at Arizona, which was also his only HR of the year...also collected his second career walk-off hit on July 24 to beat Cleveland (2-1) with an RBI single in the 14th inning...Missed 18 games (June 21-July 11) with a strained left groin muscle and had a two-game rehab stint at Northwest Arkansas (AA). Nori spent his second season with the Brewers, batting .286 with eight homers, 37 RBI and 20 stolen bases in 155games...made 146 starts, with 145 in right field and one in center field... Led the National League in singles (140)...tied for seventh in the league in multi-hit games (50) and tied for 10th in hits (171)...his 40 infield hits ranked second in the Major Leagues to former teammate Jean Segura (44)... Batted .339 (61-for-180) against left-handed pitching, which was the best average by a left-handed hitter in the Major Leagues and ranked seventh overall... Topped the club in games (155), at-bats (597), on-base percentage (.356) and walks (55)...tied teammate CarlosGomez for the team lead in runs (80)... Struck out just 40 times in 674 plate appearances, giving him the best at-bat to strikeout ratio (16.9) in the MajorLeagues...did not strike out in his final 60 plate appearances of the season...went 72 consecutive plate appearanceswithout striking out (May 25 to June 10), which was the longest streak by a Brewer since Fernando Vina also went72-straight plate appearances without a strikeout in 1998... Collected nine outfield assists, which tied for 10th-most in the National League... Recorded his first career four-hit game in the Major Leagues on his bobblehead day, April 7 vs. Arizona, going4-for-6 with three RBI, two runs scored and a stolen base... Collected his 1,500th career hit between the Japanese Central League (1,284) and Major Leagues vs. Oakland onJune 5 with an in?eld single off Bartolo Colon... Hit his 100th career home run between the Japanese Central League (84) and Major Leagues at Colorado on July 28, a solo shot off Jhoulys Chacin... Belted Milwaukee's only leadoff home run of the year on September 27 at New York Mets off Carlos Torres...itwas the second leadoff home run of his career, also doing it on September 19, 2012 at Pittsburgh... Named the Brewers' Unsung Hero as voted on by members of the Milwaukee Chapter of the BBWAA. Signed with the Brewers to a 2-year contract with a club option for 2014 on 1/17/12 ... his negotiating rights were awarded to the team by the Tokyo Yakult Swallows of the Japanese Central League on 12/19/11. Batted .288 with 10 HR, 50 RBI and 30 stolen bases in 151 games. Made 119 starts (99g in RF, 13g in CF, 7g in LF). Became the sixth player born in Japan to play for the Brewers, joining Hideo Nomo (1999), Mac Suzuki (2001), Takahito Nomura (2002), Tomo Ohka (2005-06) and Takashi Saito (2011). Became the ﬁrst position player born in Japan to play for the Brewers. Finished ﬁfth in National League Rookie of the Year voting. Led National League rookies in stolen bases (30) and tied the Padres' Yonder Alonso for the NL rookie lead in hits (150). Ranked second among National League rookies in runs (81), doubles (37), total bases (225) and on-base percentage (.355) and tied for third in extra-base hits (51). His 37 doubles established a new franchise rookie record (Prince Fielder, 35, 2006). Batted .409 (9-for-22) as a pinch hitter, best in franchise history (minimum 20ab). Produced hitting streaks of 15, 13, 10 and 12 games ... became the ﬁrst National League rookie since Bake McBride (1974) to have four 10+ game hitting streaks in a season. His 18 extra-base hits in September tied George Scott (1975) and Corey Hart (2007) for the franchise record in that month ... tied the Rays' B.J. Upton for the Major League lead for extrabase hits in September. Was named Brewers Player of the Month for September/October (.306, 4hr, 18rbi, 24r, 9sb). Made Major League debut on 4/6 vs. St. Louis and struck out as a pinch hitter off Jaime Garcia. Notched his ﬁrst Major League hit on 4/8 vs. St. Louis with a pinch-hit single off Mitchell Boggs. Made his ﬁrst Major League start on 4/11 at Chicago-NL (LF, 1-for-3, 1bb). His ﬁrst Major League home run was an inside-the-park homer off Jhoulys Chacin on 4/20 vs. Colorado ... became the ﬁrst player in franchise history to hit an inside-the-park homer for his ﬁ rst career home run. Belted a walk-off solo homer off Casey Coleman in the 10th inning to give the Brewers a 4-3 win on 6/7 vs. Chicago-NL ... was his second home run of the game (ﬁrst multi-homer game). Tied the franchise record with 4 stolen bases on 6/23 at Chicago-AL ... the record is shared with Tommy Harper (1969), John Jaha (1992) and Scott Podsednik (2004). Smacked his ﬁrst career leadoff homer on 9/19 at Pittsburgh off Kyle McPherson. October 30, 2017 New York Mets released OF Norichika Aoki. 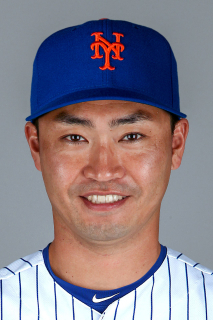 September 2, 2017 New York Mets signed free agent OF Norichika Aoki. August 29, 2017 Toronto Blue Jays released LF Norichika Aoki. August 28, 2017 Toronto Blue Jays designated LF Norichika Aoki for assignment. August 1, 2017 Toronto Blue Jays activated LF Norichika Aoki. July 31, 2017 Toronto Blue Jays traded LHP Francisco Liriano to Houston Astros for LF Norichika Aoki and RF Teoscar Hernandez. November 3, 2016 Houston Astros claimed LF Norichika Aoki off waivers from Seattle Mariners. September 6, 2016 Seattle Mariners recalled LF Norichika Aoki from Tacoma Rainiers. August 27, 2016 Seattle Mariners optioned LF Norichika Aoki to Tacoma Rainiers. July 20, 2016 Seattle Mariners recalled Norichika Aoki from Tacoma Rainiers. June 24, 2016 Seattle Mariners optioned LF Norichika Aoki to Tacoma Rainiers. December 3, 2015 Seattle Mariners signed free agent Norichika Aoki. November 4, 2015 LF Nori Aoki elected free agency. August 20, 2015 San Francisco Giants activated LF Nori Aoki from the 7-day disabled list. July 27, 2015 San Francisco Giants activated LF Nori Aoki from the 15-day disabled list. July 21, 2015 San Francisco Giants sent LF Nori Aoki on a rehab assignment to Sacramento River Cats. January 19, 2015 San Francisco Giants signed free agent LF Nori Aoki. October 30, 2014 RF Nori Aoki elected free agency. July 11, 2014 Kansas City Royals activated RF Nori Aoki from the 15-day disabled list. July 7, 2014 Kansas City Royals sent OF Nori Aoki on a rehab assignment to Northwest Arkansas Naturals. June 21, 2014 Kansas City Royals placed RF Nori Aoki on the 15-day disabled list. Left groin strain. June 21, 2013 Norichika Aoki roster status changed by Milwaukee Brewers. June 19, 2013 Milwaukee Brewers placed RF Norichika Aoki on the paternity list. January 17, 2012 Milwaukee Brewers signed free agent RF Norichika Aoki.